So Doctor Aphra #15 gets interesting as Tolvan starts getting the hots for Aphra and the Doctor gets turned on by a four armed alien. There’s mercs, surprises and some carnage as this issue dives into some serious poodoo. If there’s one thing we can gleam from this one, it’s that the gloves are off and things are going for maximum fun. The issue opens with Tolvan in Imperial custody. For receiving her third demerit, she’s sentenced to immediate execution. But first she dreams about Joystick Chevron…aka Aphra…breaking into her cell, rescuing her, and giving her a kiss. Then she wakes up, realizes it’s all a dream, and gets sent off to her firing squad. Tough break for Tolvan. Afterwards we get a peek at Triple Zero’s torture relaxation suite as he fills in Aphra on her next mission. This leads to a cool two page spread of colorful mercenaries who she’ll be working with. This leads to a crazy Alderaanian prince with a sword hacking down a crowd of stormtroopers, a mission with ties to the Clone Wars, a tooka, and good old Tolvan eventually gets a reprieve. It’s quirky, fun and inventive from beginning to end. I have to admit, I really like the tone this issue was able to capture with the story. Hopefully they can keep it going. On the art spectrum, Emilio Laiso continues to do a great job. The characters and panels look great. Rachelle Rosenberg knocks it out of the park with the colors and lighting, and together, they make a top notch looking comic. 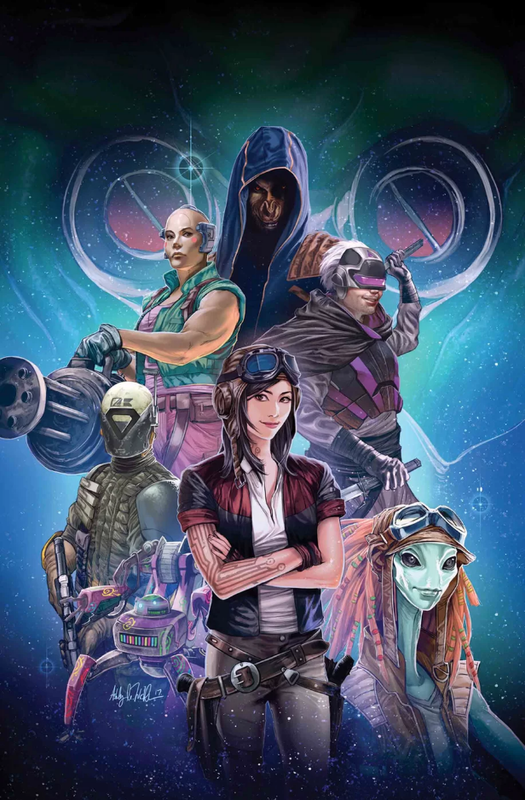 With great visuals a fun story, I give Doctor Aphra #15 a five out of five metal bikinis. I love how this one is breaking away from the movies and moving in a new direction with new characters. It’s a good move and hopefully we see more of it in other series.